This comprehensive testing service is powered by our bespoke cloud testing application Testing Manager and decades of knowledge. Lightning protection is a safety system, and its testing and maintenance is as important as your buildings fire alarms, smoke detectors and other safety systems that aim to protect against the loss of human life and damage to the structure. Regular, planned, and comprehensive testing of your buildings lightning protection system is not only a requirement under BS EN62305 (The Lightning Protection Standard) but it can also be a insurers requirement that your system is properly tested by an accredited company and in good working order. Test and inspection of all safely accessible earth positions to ensure they meet the required resistance for your system and the positions are in good order. Visual inspection of all safely accessible down conductor positions for any corrosion and general condition where applicable. Visual inspection of all safely accessible air termination networks to check general condition, connection quality and for any signs of corrosion. System wide checks for any bonds to plant or fittings that are breaking down / corroding or new items that require bonding into the system. Full test report issued within 24 hours with images of any defects where appropriate. 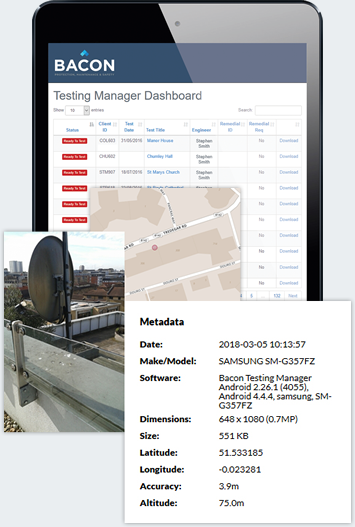 To deliver the highest quality testing service to our customers we have developed a bespoke system enabling our engineers to carry out a test logging all the data into our mobile app which is then instantly available to our inhouse testing team. Our app is enables our engineers to take supporting images or video where appropriate. To ensure total transparency and evidence for critical testing projects all images and videos taken are GPS markered and timestamped. This allows us to show where, when and who has taken the images or video to reinforce our test data.